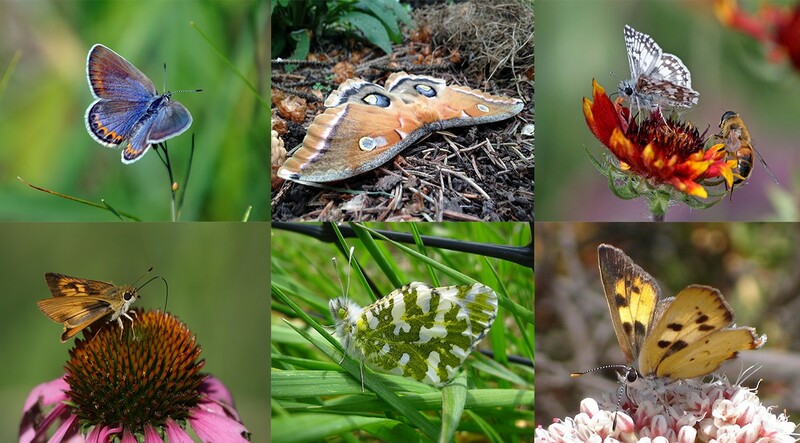 Help butterflies (and moths)…by becoming a citizen scientist! Top (left to right): Karner blue butterfly, an endangered species, found from the Midwest to Eastern seaboard by USFWS. Polyphemus moth in Minnesota by Joanna Gilkeson/USFWS. Common checkered skipper in North Dakota by Gary Eslilnger/USFWS. Bottom (left to right): Skipper in Maine by Fred Yost/USFWS. Island marble butterfly found only in the San Juan Islands off of Washington state by Karen Reagan/USFWS. Hermes copper butterfly on buckwheat, in San Diego, California by John Martin/USFWS. We admire butterflies. And while they are often portrayed as fragile creatures, they could also be accurately described as resilient. They have a surprisingly challenging lifestyle. Painted lady butterflies migrate up to 350 miles a day while monarch butterflies migrate around 3,500 miles in a single migratory window — the longest of any insect migration. Painted lady on desert pincushion in Anza Borrego Desert State Park as it migrates north from northern Mexico and Southern California during the 2019 Superbloom by Joanna Gilkeson/USFWS. Butterflies and moths undergo an almost unimaginable change from caterpillar to adult butterfly. Their ability to survive with tattered wings or a lost antennae in a world full of danger is inspiring. And many butterflies are so intertwined with the world of botany that they rely on a single host plant for survival. Left: Monarch on swamp-milkweed in Missouri. Milkweed is its only host plant. Photo by Anna Weyers/USFWS. Right: A federally endangered Laguna Mountains skipper on its host plant, Cleveland’s horkelia. Photo by Joanna Gilkeson/USFWS. During a particularly good year for butterflies, you might see dozens of them, flashing through the air like colorful confetti during peak migration or flight season. In other years, you may see very few. 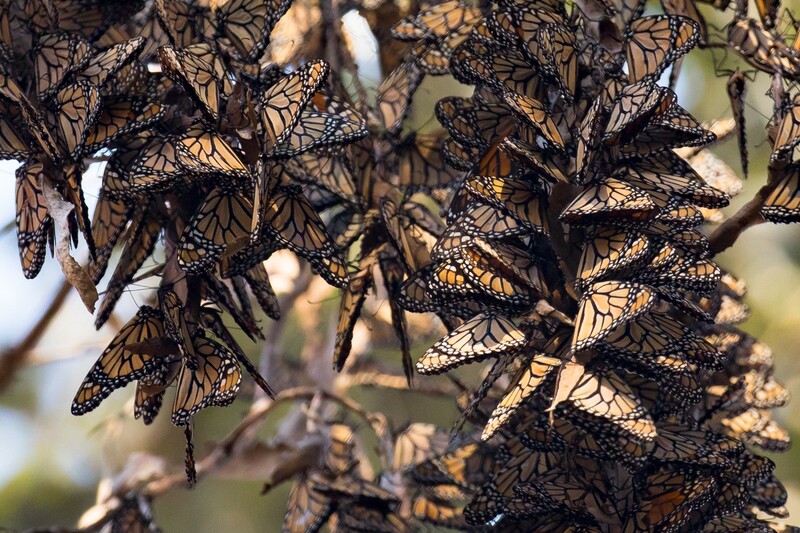 Monarch butterflies overwintering in Goleta, California by Lisa Hupp/USFWS. That’s because butterflies are a boom-bust species; meaning that their populations fluctuate greatly from year to year. This winter, monarchs migrating from the Eastern U.S. to Mexico and painted ladies born in Mexico migrating northward had a good year. But their boom-bust tendency means that next spring and summer, numbers could be much lower. Many butterfly species and insects are experiencing downward trends in population. Scientists have identified some of the factors contributing to this decline, but haven’t pinpointed a single major threat, like habitat loss. Population declines are complex, related to a combination of factors across the United States and the globe. How can you help? Citizen scientists are essential in aiding wildlife conservation. The more people you have observing wildlife and habitat conditions, the more ground you can cover. No single agency or organization alone can monitor, assess and conserve species. We’re asking the public — you, your community and beyond — to report butterfly sightings. Reporting your observations helps scientists track butterfly population numbers and better understand their conservation status. And don’t forget moths! Report the moths you see, too, as they’re just as important. White-lined sphinx moth at Seedskadee National Wildlife Refuge in Wyoming by Tom Koerner/USFWS. Report your butterfly and moth observations on free phone apps and websites (such as iNaturalist) to add your information to a larger database. You will need to upload a photo of the butterfly and provide an estimated geolocation. If you have the location tracking turned off on your phone, simply provide a general area for your sighting. Concerned you won’t know the species? That’s ok — many butterflies look similar, especially those in the blue and brush-footed butterfly groups. Citizen science reporting apps offer species suggestions and experts using the app will help confirm an identification. Chalcedon checkerspot butterfly (left) and Quino checkerspot butterfly (right) are both members of the brush-footed butterfly group. At first glance these species look similar, but there are differences in pattern, color and wing shape. Experts on citizen science apps can help ID a butterfly if you are not sure what species it is. Photos by USFWS. Monarch butterflies in the Western United States: Report monarch butterfly observations to the Western Monarch & Milkweed Mapper. This is the place to report all things monarch & milkweed. Congratulations! You made it to the end of this blog. We hope you’re ready to begin searching for butterflies. Citizen scientists observe monarch butterfly drying its wings after emerging from its chrysalis by Levi Novey/USFWS. Thank you in advance for your contributions to citizen science and wildlife conservation. If you have questions, please message us at U.S. Fish and Wildlife Service Pacific Southwest Region. Silvery blue butterfly on standing milkvetch. This butterfly is found in North Dakota and South Dakota by Tom Koerner/USFWS.